Ultimaker 2 Extended Review 2019 - Still The Best 3D Printer Today? The Ultimaker 2 Extended + is among the best-looking printers on the market today and has the price to match. Does the Ultimaker 2 Extended + live up the hype? Let’s find out. 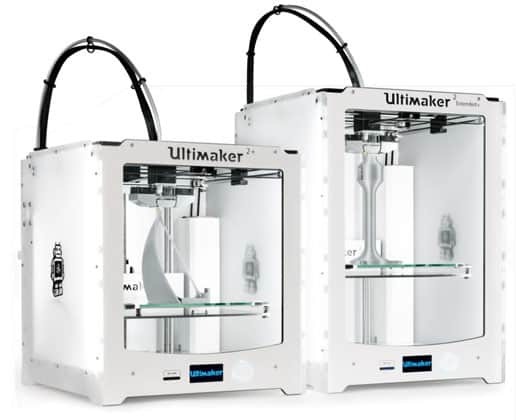 When first comparing the Ultimaker 2 Extended + to its namesake and inspiration, the Ultimaker 2 +, there doesn’t appear to be much in terms of differences other than the Extended edition being taller. In this case, our first impression is the right one, and there is nothing that sets apart the two models other than the Ultimaker 2 Extended + offering 100mm more of vertical y-axis build volume for a total of 223 x 223 x 305 mm. The extra height is suited to larger prints and can save a lot of time, and effort, by negating the need to print parts of the same build individually. The extra print area means there’s the option to render multiple build pieces during the same printing session. In keeping with the ethos of its younger brother, Ultimaker 2 Extended + is marketed as an out of the box workhorse, reliable and sturdy, that will delight seasoned makers and curious first-timers alike. Bar the extended height of 10 cm, the Ultimaker 2 Extended + returns with the partially enclosed Cartesian cube-shaped casing made of translucent acrylic bolstered by a robust aluminum frame. We are particularly fond of the case construction if only for the peace of mind it offers by limiting openings and contact points with the hot build plate and nozzle at the front and top. The sleek white, clean-cut, functional design returns as well, as does the interior LED setup. The now iconic Ultimaker robot logo adorns the side paneling for a playful twist on the often drab appearance of 3D printers. 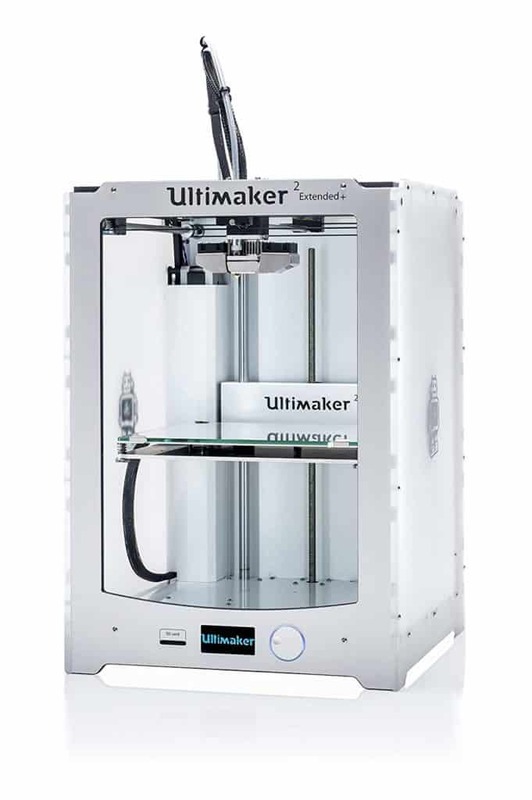 The style of the Ultimaker 2 Extended + is such that it isn’t out of place in a home office. If anything, this printer is ripe for displaying to wow visitors. 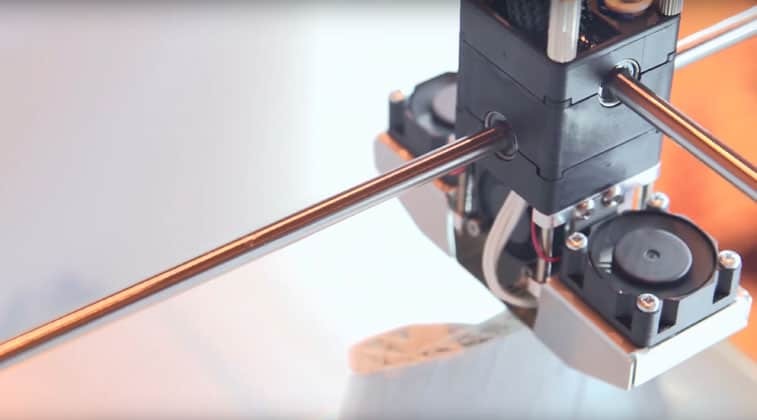 The updated parallel fan cup single extruder setup introduced for the ‘’+’’ series of Ultimaker printers returns coupled with a 50 to 100 °C heated glass build plate. The extruder manages movement on the Y and X axes, while the build plate shifts up and down on the Z axis for the added 10 cm of verticality. 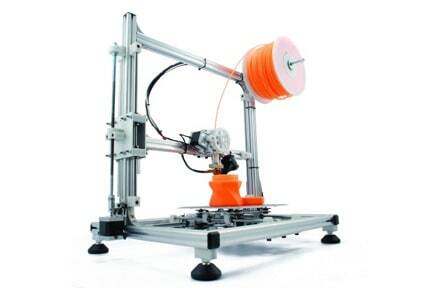 The setup adheres to the well-established Cartesian printer design. The extruder uses Fused Filament Fabrication printing tech and accepts 2.85 mm filament (PLA, ABS, CPE, CPE+, PC, Nylon, TPU 95A, PP). To keep costs down, the Ultimaker 2 Extended + supports filament from third-party manufacturers. 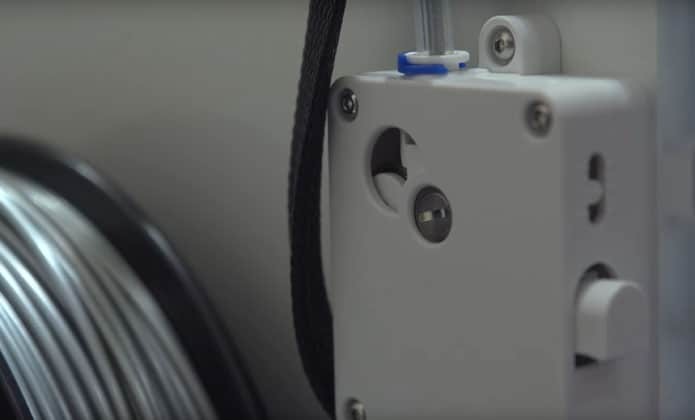 The excellent geared feeder introduced with the + model of the Ultimaker 2 range returns, which means jamming issues are all but absent while extracting and feeding in a fresh batch of the filament is much simpler than previously. Edge it into the feeder while simultaneous pressing down on the adjacent button to loosen the teeth. The Ultimaker 2 Extended + sticks to the ample layer resolution range of the original going as small as 0.02mm (20 microns) to the more standardized 0.6mm (600 microns) with a precision range of 12.5 / 12.5 / 5 microns. This generous array is assured by an Olsson Block Kit featuring easily interchangeable nozzle diameters including 0.25 mm, 0.4 mm, 0.6mm, and 0.8 mm. The printer ships with the necessary tools to quickly swap out the nozzles as required. With such a rich arsenal of resolutions to choose from, the Ultimaker 2 Extended +’s focus on versatility is blatantly apparent with the ability to complete projects from minuscule, detailed-oriented prints, to bigger prototypical prints. 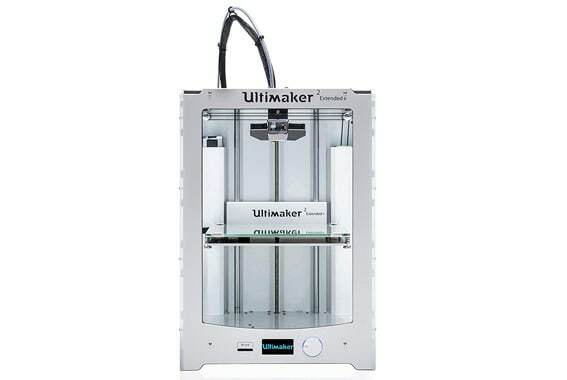 As for connectivity, the Ultimaker 2 Extended + uses a standalone SD card setup, with the slot sitting at the bottom of the unit alongside the LED control panel and a rotating click wheel. 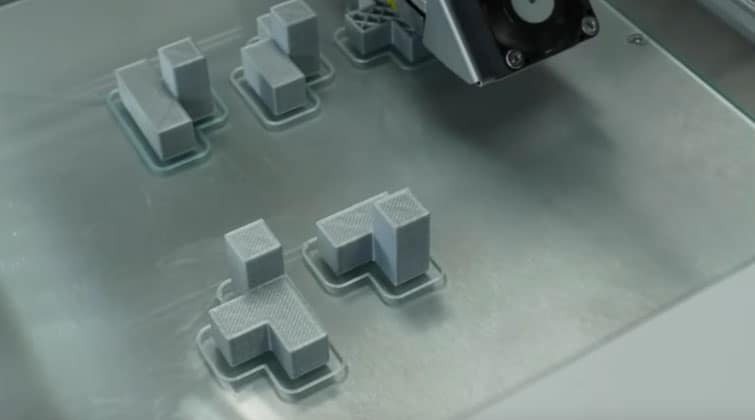 The lack of USB or Wi-Fi connectivity is detrimental to our overall appreciation of the printer, but the SD system coupled with the excellent Ultimaker Cura software works efficiently enough. The panel and wheel appear to be identical to those on the Ultimaker 2 +, which we found to be responsive and accurate. The control panel is particularly useful when turning on the printer for the first time, changing the filament, or triggering a new print as it provides an abundance of information and steps to follow. The Ultimaker Cura software supports integration with popular software like Siemens NX, Autodesk, and SolidWorks. It also offers standard material profiles that help circumvent issues during the creation of .gcode files and the printing process itself. Cura is compatible with Windows, Linux, and macOS while capable of reading a remarkable wealth of formats, which are STL, OBJ, X3D, 3MF, BMP, GIF, JPG, PNG. For the price of the Ultimaker 2 Extended +, we’d expect nothing less than exceptional printing quality and, in general, the printer lives up to this. Be it square shapes and edges, or intricate rounded designs; the prints were systematically good. We encountered the odd error or layering mishap, but nothing significant enough to warrant concern and which we put down to a regular part of 3D printing rather than a deep-seated issue with the printer itself. Never did the print end up a mess of wasted filament. Instead, we saw minor imperfections rather than major flaws. When the Ultimaker 2 Extended + is pushed to create detail capable of rivaling the performance of pricier models, it doesn’t fare as well, but globally, the printer was able to print at a high level of complexity especially at slower speeds. Overall, the sense of satisfaction of minimal setup coupled with incredible print quality is what stands out from our experience. Ultimaker has been extraordinarily successful at offering a straightforward, immediate, and fulfilling printing process. The printer is also surprisingly quiet meaning it doesn’t need to sit in dark workshop or garage while working away. The Ultimaker 2 Extended + ships with the printer, a handy quick start guide, an Olsson Block Kit, a 750 g spool of silver Ultimaker PLA, a spool holder, an SD card (4GB), a USB cable (for firmware updates only), a calibration sheet for the leveling the bed, a power supply unit, a kettle lead, a set of tools and a selection of adhesives and lubricants (grease, glue). As is customary for Ultimaker products, the printer is unquestionable well-packaged. Unpackaging involves removing a few slices of protective styrofoam blocks, pulling the printer out, snipping a couple of zip ties and removing some protective sheets inside the casing designed to minimize damage during transit. 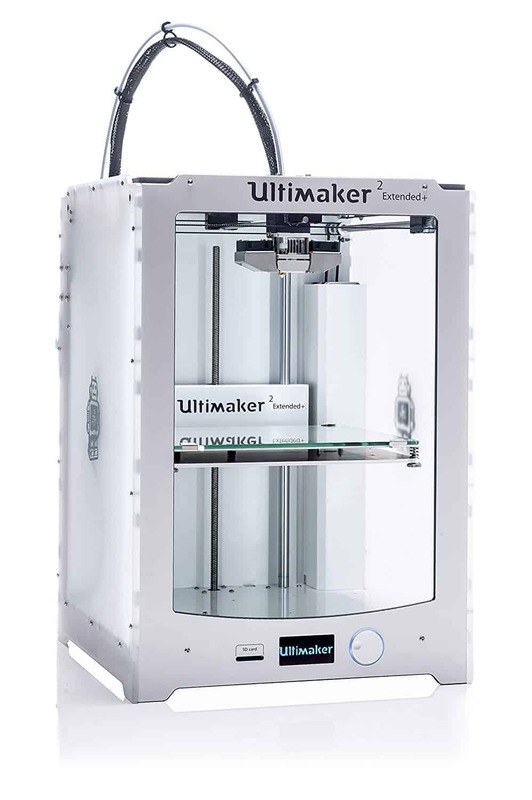 The Ultimaker 2 Extended + comes more or less pre-assembled with only the heated glass and the spool holder requiring installation. The holder snaps into the back of the unit quickly, while a set on metallic clips secures the heated bed to keep it in place. Powering up the printer for the first time triggers the previously mentioned first time installation walkthrough on the control panel which will guide you through calibrating the heated bed. The calibration involves tweaking four micro-adjustable screws positioned on each corner. The lack of an auto-calibration feature seemed a rather sizeable oversight for such a pricy machine, but the way the printer provides specific and easy to follow instructions to level the heat bed means this isn’t a negative. Position the extruder at three points on the bed then follow the instructions to adjust the screws provided by the printer. The process is hassle-free and takes only a matter of minutes. A novice won’t stumble while a veteran is sure to be baffled at the ease of the whole procedure. Next, the printer explains how to feed the filament into the geared feeder which involves gently easing it in until the teeth have a firm grip of the material. The printer does the rest, guiding the filament to the hot end. When ready to print, just let the printer know the type of material used via the control panel, pop in the SD card, choose your print, and you’re off. The Ultimaker 2 Extended + 3D printer ships with a comprehensive 12-month warranty for the usual set of defects ranging from workmanship to parts. Authorized third-party retailers may have additional guarantees to this, so check before buying. 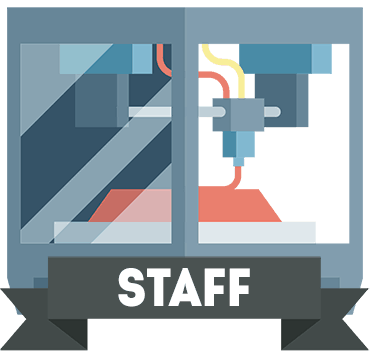 As for support, Ultimaker boasts lifetime support through a library of support articles on their website, as well as a dedicated support team that can be contacted by all the usual channels (telephone, email, and live chat). Of the pre-assembled printers on the market, the Ultimaker 2 Extended + sits uncontestedly at the top of the pile when it comes to value for money. The price paid is equivalent to the quality of the build and the prints. 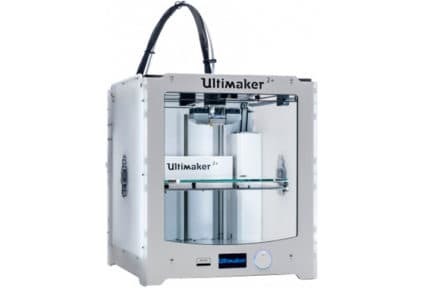 To make the higher price palatable compared to the Ultimaker 2 +, which may be sufficient for makers focused on smaller projects, make sure it is indeed needed and justified. The only real criticism is the lack of a dual extruder setup. The printer screams dual extruder compatibility and having that type of versatility would have rocketed the Ultimaker 2 Extended + into untouchable territory in comparison to similarly priced models. The Ultimaker 2 Extended + is among the best pre-assembled printers on the market today. The extra height is a welcome addition and warrants the increased price tag.